With the Dresden Files, Jim Butcher is doing the impossible–writing a series that gets more entertaining with every book. Easily the best fantasy series on the market today, I’d even go so far as to say that the Dresden Files novels are as good as, if not better than another series of books with a guy name Harry in them. The fourth book in the series “Summer Knight” is one that will not disappoint readers. 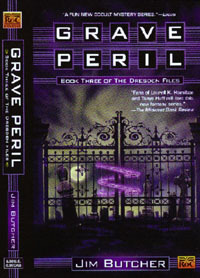 Picking up a few months after the events of “Grave Peril” in which Harry lost a girlfriend, made a deal with his faerie godmother to save himself and his friend and precipiated a war between the White Council and the Red Council, Harry starts the novel in a bad place. He’s obsessed with finding a cure for his lost love Susan, he’s barely been in the office in months, he’s aliennating his friends and he’s got a price on his head by the Red Council. And that’s even before he finds out that his faerie godmother sold the favors he owed her to another and the White Council is coming to town. The story unfolds at a natural but rewarding pace. Butcher has a natural ability to have events build on each other and he pays off hints from previous novels as well as dropping in hints of things to come. And this book feels like just a snapshot of a few of the big events in Harry’s life over the course of a couple of days from the grander scheme of things. The strength in these stories is they’re rewarding to read just as stand-alone novels, but taken within the greater context of the series, they add even greater layers. And while I will recommend reading them in order, Butcher does enough to bring in new readers that you can drop in on Harry at this point and not feel hopelessly lost. 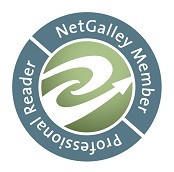 All the while, he doesn’t aliennate long-term readers with pages of recap. A great series of books that only gets better. This is the best I’ve read in the series and I can’t wait to start the next one. Oh one word of warning: Don’t start any of the Dresden books if you’ve got things to do like sleep, go to work, spend time with the family. These are the types of books that will consume you, demanding your attention to savor every page and anticipating what will come on the next. For a novel called “The Undead Kama Sutra,” you’d expect this to be a fun read in that guilty-pleasure sort of way. Unfortunately, that’s just not the case with the latest installment in the Felix Gomez series. Gomez is a former soldier who was turned to a vampire in Iraq. He comes home and becomes a sort of supernatural private investigator who had previous encounters with aliens in area 51. His latest escapades find him searching for the mythical undead kama sutra that is supposed to have powers for the undead set based on the release of sexual energy. Before he knows it, he’s caught up in following the mysterious death of someone at the apparent hand of aliens and looking into matters for the council that rules vampires in Max Acevado’s universe. On paper, all that sounds like the makings of fun read that would be almost perfect for the upcoming beach season. It should be a book that you’d recommend to people because the title is so good and the book is a trashy, guilty pleasure kind of fun. In a lot of ways, this reads like a bad knock-off of Jim Butcher’s far superior Harry Dresden series. And with the success of Dresden, there is room on the shelves for the same type of fun, fantasy reads. Unfortunately, this one isn’t one of them. I’ve heard the Dresden Files series called “Harry Potter for adults.” And while it’s an apt-description, I think it also does a disservice to the masterful work Jim Butcher is doing creating one of the richest and most entertaining on-going series of fantasy novels on the market today. One huge plus for the Dresden novels is that Butcher has achieved the perfect balance of creating novels that are accessible no matter where you drop into the series (not an easy thing to do) and rewarding fans who have read all the books and will pick up little nuances and hints from story to story. The novels also have an effortless way of foreshadowing events to come in a way that feels completely natural, leaving the reader wondering about things but not feeling shortchanged if events hinted at or brought up aren’t directly addressed in the novel you’re reading. And the biggest asset these novels have is the voice of Harry Dresden. Told from the first-person perspective of Harry, the novels invite readers in. I defy you to pick up one and intend to read for just a chapter and not look up several chapters later to see that time has slipped away and you’ve not noticed. That’s how compelling and interseting not only the universe of Dresden is, but also the Dresden character himself. And it starts with the first three novels of the series. 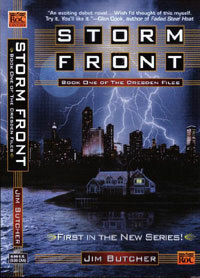 In a lot of ways Storm Front and Fool Moon are set-up novels that create and establish the rules for the Harry Dresden universe. Dresden is a practicing wizard/private investigator working out of Chicago. He works as a specialist consultant for the police force and is called in when strange things happen and require his expertise. Early on, it’s apparent that Butcher is treating his universe with the respect that Joss Whedon did in creating the Buffy-verse. Supernatural things happen and instead of reflecting on “wow, weird stuff is going down,” the stories take it in stride and use that as part of the overall element of telling the story. Now, I’ll have to confess that I broke my usual “read them all in order” rule on these. I read the sixth novel first because the first page hooked me. I then read the third and then the first two. And yet, knowing how some things may play out, it never ruined the first novels for me. Again, this is a strength of the novels–they allow you to jump in for a couple of days or some big events in Dresden’s life. And there is some recap of previous events as needed–enough to tell the story in the latest book, but not so much as to discourage you from seeking out the other novels. That said, I am going to try to review them in order and read the rest in order even though I have the latest one sitting at home, mocking me with its newness. Storm Front and Fool Moon are novels that set up and estabish the universe of Dresden. We meet Harry and a wide range of the supporting characters from Lt. Karin Murphy to Detective Carmichael. In Storm Front, Harry is brought in on two cases–one from a woman who suspects her husband is abusing magic and the other being the brutal death of a couple in the throws of passion due from the use of magic. Harry’s investigation of the two separate crimes is intriguing and we slowly begin to realize that the two may be related. The novel ends with a great showdown with another powerful wizard. Along the way, you’ll encounter Bob, the spirit who lives in a skull in Harry’s lab, Johnny Marcone, a Chicago gangster and Susan, a love interest who is pivotal to the third novel of the series. It’s a nice introduction to the characters and the universe and the mystery is well plotted and the solution not telegraphed so far in advance that I guessed the outcome before Harry did. 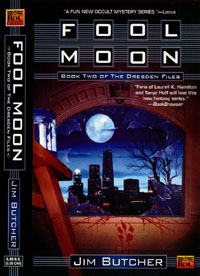 In Fool Moon, werewolves enter the Dresden universe equations. The story continues to expand the Dresden universe and even makes the gutsy move of killing off a recurring character during the course of the story. Harry finds himself caught up in a conflict and with a rampaging louis-garoux on the loose. His already strained friendship with Murphy is tested even more and Harry is forced to go on the lam. The final chapters as everything comes together are superb. I’ll warn you that if you start reading the last hundred pages as you get ready to go to bed, don’t expect to sleep any time soon. They are page-turning and addictive. Also, Butcher is able to pull off a scene in which Harry is knocked unconsious and talks to an inner-version of himself in order to piece together the current mystery and offers hints at the future. This is a scene that could easily have been clunky or felt inserted because Butcher couldn’t find any other way to get from point a to point b. Instead, it works as a way to reasonably have Harry solve the mystery and to hook you into wanting to find out more in the later stories. But it’s really Grave Peril where things begin to happen. Having spent two books meeting and getting to know Harry, it’s here the universe expands and we get a lot more hints about Harry’s past and backstory. It starts off with the simple concept of Harry wanting to save some babies from a ghost and expands from there. What I love about this novel is that it plunks us down as the events are unfolding and shows us that ghost apperances in Chicago have been going on for several weeks. Other authors could have included a clunky prologue to show this, but Butcher chooses to go with weaving the background into the story in a natural way that gives the books authenticity. As the book unfolds, we find out Harry and Susan are an item, though Harry has reservations about allowing her too far into the supernatural world in an attempt to protect her from some of the nastier things out there. We also find out more about a deal Harry made and what he owes his faerie godmother. The various threads eventually merge in the stunning finale as Harry is dealt some critical losses. It’s a brave, bold choice for only the third book in a series and it makes you respect what Butcher is doing and what he’s achieved with the series. 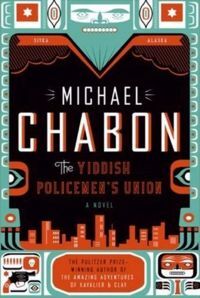 Michael Chabon’s The Yiddish Policemen’s Union came highly recommended, critically acclaimed and on the shortlist for this year’s Hugo Award. And that said, I don’t see what all the buzz is about. The story is an alternate history and it’s got an intriguing premise. But I just had a hard time getting into or caring about the story or characters for any sustained period of time. There were flashes where the book was bordering on brilliance, but there was a lot in between that just never grabbed me. A disappointment. Maybe I had my expectations up so far that no book could ever live up to them. 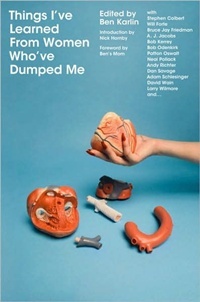 Getting dumped is never any fun. But these series of essays from some of today’s top funny guys almost makes it worthwhile. Well, maybe not really, but the essays are fun, breezy and most importantly amusing. My favorite was by the creator of News Radio, Paul Simms, covering the many crushes he experiences throughout a normal day on women, lasting anywhere from 30 seconds to a few minutes. Another essay on the first teenage relationship and how a misunderstanding of what she was trying to say led to years of resentment and then a realization is also nice. If you’ve ever been dumped, you’ll find something here to enjoy. And at least you don’t have to take the advice of one author and just go bitter. “Planet of the Apes” is one of those books that’s hard to approach without bringing along the baggage of the original 60s film adaptation or the less-than-successful remake a few years ago. The original film is such a part of our pop-culture concsiousness that it’s almost impossible to separate it from what we have here. This is one of those books that is what it is–no more, no less. I could spend several paragraphs detailing the differences between the movie and the book, but that would be kind of pointless and wouldn’t tell you much about the book as a whole. That said, Boulle’s original novel is a social satire, as advertises and it’s one of what I’d classify as a fairly light, “bubble-gum” sci-fi read. It has just enough in there to make you think while reading it, but it’s not going to stay with you long after you’ve finished the final pages. The thing is that not a lot of the characters have much depth. They’re all in here to be part of the satire of modern life and humanity’s relationship with each other and animals. For a satire that wants to point out how drawing distinctions based on external apperances isn’t a great thing, you’d think it would have a bit more depth to the characters. Add to that that the central narrator has a tendency to become a bit pompous in his relation of events and you’ve got a story that works, quite frankly, better as a movie than it does as a novel. I’d even go so far as to say that without the series of movies, this is one novel that would have faded in memory long ago, remembered by some who read it for a few of the twists in the final pages but not much more. It’s not to say I hated this novel. But it’s not to say I loved it or found it nearly as compelling as some of the mid-range works by Issac Asimov or Orson Scott Card. The latest in Stephen White’s Alan Gregory series of novels continues his recent trend of shifting between multirple perspectives among the various protagonists, always settling and centering on Boulder pysychologist Gregory. “Dead Time” weaves together three perspectives as it slowly unravels the mystery of what happened years before when some friends camped out on the floor of the Grand Canyon. A woman disappeared under strange circumstances and has never been found since. What happened to her and the impact it had on the friendships of those on the trip plays a significant role for the rest of the novel. The other threads slip back and forth between first-person perspective of Alan and his ex-wife Meredith. Meredith comes back into Alan’s wife when she attends a funeral of an old friend in Colorado and later when Alan visits New York for a few weeks with his newly adopted son. Meredith needs Alan’s help to look into disappearance of the surrogate mother she and her fiancee are using. Both the surrogate and the fiancee were part of the trip to the floor of the Grand Canyon. What unfolds next is a series of revelations at a fairly reasonable rate, all grounded and set up by the early stages of the novel. And while the central mystery of what happened or what it means to the characters today isn’t exactly the most original mystery storyline around, it’s still compelling enough to keep reader interest as the pages turn. What is far more interesting is the shifting perspective between Alan and his ex-wife and how they see the world and each other. Also, readers of the series will know that Alan’s current marriage is on dicey ground and following Alan’s struggles with tempations as he and his wife are geographically separated for the summer is intriguing. The real meat of the story comes from the glimpses and justifications as well as the blindness to faults he’d find in patients that Alan undergoes as the story unfolds. And once the central mystery wraps up, there are still a few revelations about Alan’s personal life to come that are clearly setting things up for the next installment. It’s not quite as “holy cow, I’ve got to know what’s next” as the developments to Inspector Thomas Lynley in Elizabeth George’s novels, but it’s still enough to make the year or so wait between this book and the next an interesting one.